It is officially autumn when I start listening to Margot and the Nuclear So and So's Broadripple is Burning. In the beginning of my final year at college I found their brand new album in a pile of CD's at the student radio station and listened to it on repeat until all the leaves had fallen and the smell of snow hung heavy in the air. That was my last year living in central Pennsylvania where the autumn colors are daylight fireworks. The passage of the seasons sneaks up on me in New York and it changes instantaneously. I loved easing into each season, seeing the daily changes, and slowly soaking in the sound of a single band over the course of a few weeks. While my outfit has very little to do with my musical signal that the seasons have changed, it does feel like very seasonally appropriate attire. I picked up this secondhand Marc by Marc Jacobs skirt a few weeks ago at Beacon's Closet. The rich colors and geometric pattern drew me to it initially, but the kicky inverted pleats and twirl factor made it an immediate favorite. I paired it with autumnal staples including my trusty vintage Selby pumps and cozy navy sweater. Incredible skirt, it really pops when paired with dark solids. Plus this is a great little setting for photos! I've been on the lookout for some new ear candy the last while but too lazy to put in the time it usually takes for a band to grow on me..but within a few seconds of listening to that song I'm hooked!! Your skirt is gorgeous (& I love your sweater too)...it's always that bit extra sweet getting a designer item at a reduced price! Do you use Spotify? I really like it for finding new music because it shows me what my friends are listening to (and most of them have great taste!). Oh my goodness, I am in love with this entire outfit, how lovely! I've never heard of Spotify having a limit! Does it really? love the marc by marc jacobs skirt! 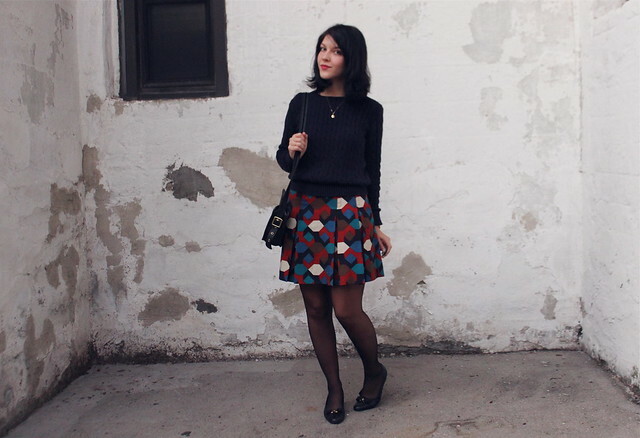 a perfect fall skirt! I seriously love this jersey! I'm just a poorly 'free user' so I guess I should just shell out and stop complaining :) But it's something like 10 hrs a month free listening and a max of 5 repeats a month per song. that skirt is such a good find! And I agree, the colors are very fall appropriate. Does Margot and the Nuclear so and sos sing that one song called "skeleton key" because if so I used to be obsessed with that song! I'd listen to it in the car on repeat for weeks. LOVE the skirt! How do you always look so classic but still so cool? IDGI. Teach me. I will teach you, but I need a trade on every tip you can give me about going to grad school in the UK. This is so perfect. I just love your classic cable knit sweater. I really need to find one like that because the fit is so nice. Not too big, but still cozy! 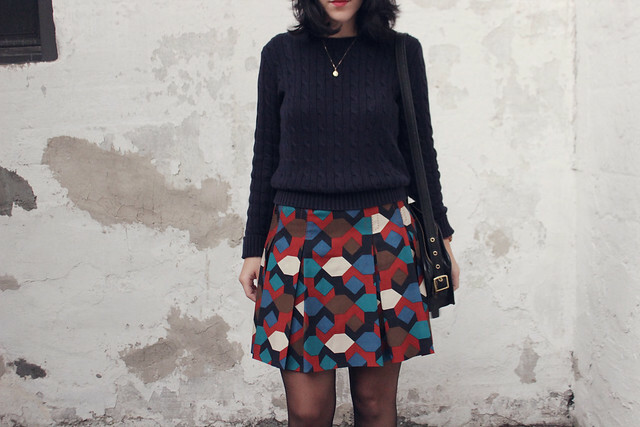 I'm really loving the fun print on your skirt too!